This article is about the medieval Catholic chivalric military orders. For modern military orders of merit, see Military orders, awards and decorations. Indications of presence of military orders associated with the Kingdom of Jerusalem and the Holy Land during the Crusades (in German). 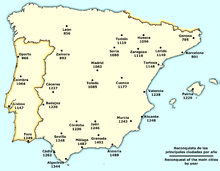 Reconquista of the main towns (per year) (in Spanish). Extent of the Teutonic Order in 1410. A military order (Latin: Militaris ordinis) is a chivalric order with military elements. Western military orders were originally established as Catholic religious societies; the first orders originated during the medieval Crusades with the stated purpose of protecting Christians against violent persecution by Islamic conquests in the Holy Land, which later evolved into serving as a standing army that defended the Kingdom of Jerusalem. Most members, often titled knights were laymen; however, they cooperated with the clergy, frequently taking religious vows such as poverty, chastity, and obedience, according to monastic ideals. Prominent examples include the Knights Hospitaller and the Knights Templar, as well as the later Teutonic Knights in the Baltics. The Knights Templar, the largest and most influential of the military orders, was suppressed in the early fourteenth century; only a handful of orders were established and recognized afterwards. However, some persisted longer in their original functions, only later evolving into purely honorific and/or ceremonial chivalric orders with charitable aims in modern times, such as the Sovereign Military Order of Malta and the Order of the Holy Sepulchre, both of which are still conferred as Papal orders of knighthood. Notably, the Teutonic Order became exclusively monastic except a limited associated confraternity of honorary Knights. In 1053, for the Battle of Civitate, the Knights of Saint Peter (Milites Sancti Petri) was founded as a militia by Pope Leo IX to counter the Normans. In response to the Islamic conquests of the former Byzantine Empire, numerous Catholic military orders were set up following the First Crusade. The founding of such orders suited the Catholic church's plan of channeling the devotion of the European nobility toward achieving the Church's temporal goals, and it also complemented the Peace and Truce of God. The foundation of the Knights Templar in 1118 provided the first in a series of tightly organized military forces for the purpose of opposing Islamic conquests in the Holy Land and in the Iberian Peninsula — see the Reconquista — as well as Islamic invaders and pagan tribes in Eastern Europe which were perceived as threats to the Church's supremacy. The first secularized military order was the Order of Saint George, founded in 1326 by King Charles I of Hungary, through which he made all the Hungarian nobility swear loyalty to him. Shortly thereafter, the Order of the "Knights of the Band" was founded in 1332 by King Alfonso XI of Castile. Both orders existed only for about a century. The original features of the military orders were the combination of religious and military ways of life. Some of them, like the Knights Hospitaller and the Knights of Saint Thomas, also had charitable purposes and cared for the sick and poor. However, they were not purely male institutions, as nuns could attach themselves as convents of the orders. One significant feature of the military orders was that clerical brothers could be subordinate to non-ordained brethren. In 1818, the orientalist Joseph von Hammer compared the Catholic military orders, in particular the Knights Templar, to certain Islamic models such as the Muslim sect of Assassins. In 1820, José Antonio Conde suggested they were modeled on the ribat, a fortified religious institution which brought together a religious or hospital way of life with fighting the enemies of Islam. However popular such views may have become, others have criticized this view, suggesting there were no such ribats around Outremer until after the military orders had been founded. The role and function of the military orders extended beyond their military exploits in the Holy Land, Prussia, and the Baltics. In fact, they had extensive holdings and staff throughout Western Europe. The majority were laymen. They provided a conduit for cultural and technical innovation, such as the introduction of fulling into England by the Knights Hospitaller, and the banking facilities of the Knights Templar. These are military orders listed chronologically according to their dates of foundation and extinction, sometimes approximate due to scarce sources, and/or repeated suppressions by Papal or royal authorities. Presently active institutions are listed in consideration with their legitimacy according to the International Commission on Orders of Chivalry. They are divided into international and national according to their adherence, mission, and enrollment, disregarding the extent of eventual gradual geographical distribution outside of their region of concern. Cardinal (1630-) Today the Catholic Order is known as the Sovereign Military Order of Malta. Officially it still remains a Catholic order, however continuous Regional connections are claimed by Freemason bodies and the Protestant chivalric orders of the Alliance of the Orders of Saint John of Jerusalem. Pope: 1489- Awarded to prominent pilgrims. Reorganised as Sacred and Military Order of the Holy Sepulchre in 1496 by Pope Alexander VI. Reorganised by Pope Pius IX with the residential restoration of the Latin Patriarchate of Jerusalem in 1847. Known as the Equestrian Order of the Holy Sepulchre of Jerusalem since 1931.
until 1312 by Pope Clement V Pope: 1129-1312 1312 The Knights Templar order was reconstituted in Portugal after the Templars were abolished on 22 March 1312 by the papal bull,Vox in excelso, issued by Pope Clement V. King Dinis I of Portugal created the Order of Christ (Portugal) in 1317 for those knights who survived their trials throughout Europe and was officially founded in 1319, The property of the Templars was transferred to the Knights Hospitaller except in the Kingdoms of Castile, Aragon, and Portugal. In effect, causing the dissolution of the Templars by the rival order. Thus when being recognized, the Pope allowing only the "Order Of Christ" a Portuguese order and its Papal branch Supreme Order of Christ can claim to have any descent from the Templars, which is now used for Honorary State merits in Portugal and preserved as such. (1856) Italian branch merged 1572 with the Order of Saint Maurice to form the Order of Saints Maurice and Lazarus under the Royal House of Savoy, still extant. In 1609, King Henry IV of France linked it in France administratively to the Order of Our Lady of Mount Carmel to form the Royal Military and Hospitaller Order of Our Lady of Mount Carmel and Saint Lazarus of Jerusalem united, which remained listed as of royal protection in the French Royal Almanac until 1830. Royal protection of the Royal house of France renewed 2004. 1672 Primarily provided safety and protection to Italian pilgrims to the Holy Land and Camino de Santiago. Merged with the Order of Saint Stephen in 1587 by Pope Sixtus V at request of Grand Duke of Tuscany. In France absorbed into the Order of Saint Lazarus in 1672. House of Aviz: 1385-1580 1789 Secularised 1789. Statutes revised repeatedly together with the other Portuguese orders of merit, during the First Republic (1910–1926), then in 1962, and again in 1986. Order of Calatrava 1158 Raymond of Fitero Calatrava la Vieja, Kingdom of Castile, Spain 1164 by Pope Alexander III House of Bourbon 1838 by secularisation King Charles III of Spain requested old orders to contribute to his new order in his name (1775), which led to dissolution. Confiscated by King Joseph (1808), re-established by Ferdinand VII at the Restoration (1814). Secularised in 1838. 20th century Historically both religious and chivalric. In 1692 in France, King Louis XIV merged it with his own Order of Our Lady of Mount Carmel. The remaining organisation was edicted in 1700 as purely religious order. Offshoots of the order in France survived into the 20th century. Order of Aubrac 1162 Aubrac, France 18th century Disappeared during the French Revolution in late in the 18th century. Order of Mountjoy 1180 Holy Land 1221 Merged into the Order of Calatrava. Teutonic Knights 1190 Acre, Israel Converted into a purely Catholic religious order since 1929. Order of Monfragüe 1196 1221 Merged into the Order of Calatrava. Order of Sant Jordi d'Alfama 1201 15th century Early 15th century, merged into the Order of Montesa. 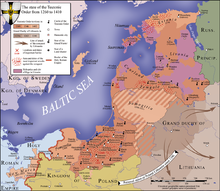 Livonian Brothers of the Sword 1202 1236 Merged into the Teutonic Order as the Order of Livonia, disbanded 1561. Order of Dobrzyń 1216 Dobrzyń Land, Poland 1240 Small number, maximum 35 knights. Battled by the Prussians, around 1235 most knights joined the Teutonic Order. In 1237 the rest of the brothers reinforced Drohiczyn by order of Konrad. Last mentioned when Drohiczyn was captured by Prince Daniel of Kiev in 1240. Militia of the Faith of Jesus Christ 1221 1285 Note: Symbol that of the Dominican Order. Merged into the Third Order of Saint Dominic. Confirmed 1292 by ambassador of Pope Nicholas IV Mainly hospitals, in Bohemia still existing. Militia of Jesus Christ 1233 Bartolomeo da Vicenza Parma 22 December 1234 by Pope Gregory IX. 1250s Disappeared mid-13th century. Order of Saint Mary of Spain 1270 1280 Merged into the Order of Santiago. Order of the Dragon 1408 Sigismund of Luxemburg Hungary 1475s Disappeared late 15th century. Order of Saint Maurice 1434 Amedeo VIII of Savoy Château de Ripaille, Thonon-les-Bains, Savoy 1572 Merged with the Order of Saint Lazarus in Italy in 1572 by Pope Gregory XIII into Order of Saints Maurice and Lazarus, considered the legitimate successor of both by the ICOC. Order of the Tower and Sword 1459 King Afonso V of Portugal Portugal Revived 1808 by Prince Regent John, later John VI of Portugal. Since the end of the monarchy in 1910, all military orders abolished except the Order of the Tower and Sword, with President of Portugal ex officio its Grand Master. Order of Our Lady of Bethlehem 1459 Pope Pius II Lemnos, Byzantine Empire 18 January 1459 by Pope Pius II 1460 Founded in 1453 by Pope Pius II after the Fall of Constantinople to the Ottoman Empire, to defend the island of Lemnos, soon recaptured by the Turks, thus rendered useless and suppressed almost as soon as founded. Cardinal protector in 1910 by Pope Pius X Decrees by King Philip III of Spain, Ferdinand II, Holy Roman Emperor on 7 November 1630 Appears to have been established between 1520 and 1545, with certain statutes dated 1522 by the Angeli Comneni family. Its Grand Master Andrea Angelo Flavio Comneno was addressed first in 1550 by Papal bull Quod Aliasla by Pope Julius III. Order of Saint Stephen Pope and Martyr 15 March 1561 Cosimo I de' Medici, Grand Duke of Tuscany Tuscany 1 October 1561 by Pope Pius IV Founded as Benedictine order by Cosimo I de' Medici,. dedicated to the martyred Pope Stephen I and the victories at the Battle of Montemurlo in 1537 and the Battle of Marciano (Scannagallo) in 1554. Fought the Ottoman Turks and pirates in the Mediterranean Sea. Abolished in 1859 by the annexation of Tuscany to the Kingdom of Sardinia. Present, Catholic continuation claimed by Archduke Sigismund, Grand Duke of Tuscany. Chivalric and/or military orders that could qualify depending on definition. Military Order of Cross-bearers with the Red Star on a Blue Field, hospitaller and/military order active from the 12th century until suppressed in 1656 by Pope Alexander VII. A few of the institutions survived into honorific and/or charitable organizations, including the papal orders of knighthood. While other contemporary Catholic societies may share some military organizational features and ideology, such as the Society of Jesus, they differ from the medieval military orders in the absence of military purposes or potential. Modern orders may still be founded explicitly as a military order; the Military Order of Loyalty (Spanish: Orden Militar de la Constancia) was founded in 1946 by the Spanish protectorate in Morocco. Awarded to both Spanish and Moroccan military officers and soldiers, the single-class order was abolished in 1956. ^ a b Crawford, Paul (1996). "The Military Orders: Introduction". The ORB: On-line Reference Book for Medieval Studies. Archived from the original on 6 October 2014. ^ Michael Jones ed., The New Cambridge Medieval History, vol. 6: c. 1300 - c. 1415, (Cambridge, 1998), p. 209. ^ Beyond the Craft by Keith B Jackson, published 1980 by Lewis Masonic (Terminal House, Shepperton, Middlesex, TW17 8AS, England), and subsequent later revised editions. Current (5th) edition (2005) is ISBN 0-85318-248-5. ^ The Orders of Saint John Joint Declaration dated 14 October 1987. ^ "Equestrian Order of the Holy Sepulchre of Jerusalem". Retrieved 24 January 2015. ^ a b Almeida, Gomes Abrunhosa Marques de and Manuel Ângelo (2007). Precedentes histórico-teóricos dos regionalismos dos Açores e da Galiza. Santiago de Compostela: Univ Santiago de Compostela. p. 187. ^ Cheke, Marcus (1969). Carlota Joaquina, queen of Portugal (Reprinted. ed.). Freeport, N.Y.: Books for Libraries Press. p. 195. ISBN 978-0-8369-5040-3. ^ Jenks, George C (1911). Monarchs in Exile, The Bookman vol. 32. New York: Dodd, Mead and Co. p. 273. ^ Sainty, Guy Stair (2006-11-22). "Royal Order of Saint Michael of the Wing". rec.heraldry. Retrieved 2011-01-21. While the Duke of Braganza is the unquestioned heir and successor of Dom Miguel, the institution of the Royal Brotherhood of St Michael of the Wing is better seen as a modern memorial revival of the original institution than any kind of continuation of the Miguelist award. ^ Carmichael, Montgomery (1901). In Tuscany: Tuscan Towns, Tuscan Types and the Tuscan Tongue. New York: E P Dutton. p. 173. The Order was swept away by the French Revolution but was revived again in a modified form in 1817. The Italian Revolution once more swept it away beyond hope of revival on 16 November 1859 and its Church and property became the property of the State. Alas that modern Italy should not be a little more tender of the memories of her past glories. ^ Bernardini, Rodolfo (1990). Il Sacro Militare Ordine di Santo Stefano Papa e Martire (in Italian). Pisa: Familiare della Casa Asburgo Lorena. ^ Cardinale, Hyginus Eugene (1983). Orders of knighthood awards and the Holy See. Gerrards Cross: Van Duren. p. 157. ISBN 978-0-905715-13-1. Wikisource has the text of the 1921 Collier's Encyclopedia article Military Orders. Herbermann, Charles, ed. (1913). "Military Orders" . Catholic Encyclopedia. New York: Robert Appleton Company. Nicholson, Helen J. The Knights Hospitaller (2001). Riley-Smith, Jonathan. Hospitallers: The History of the Order of St John (1999). Burman, Edward (1988). The Templars: Knights of God. Inner Traditions/Bear.